A masterful introduction to world mythology, shedding light on the impact it has had on cultures past and present and untangling the complex web of deities, monsters and myths. From the signs of the zodiac to literature and art, the influence of world mythology can still be seen in everyday life. 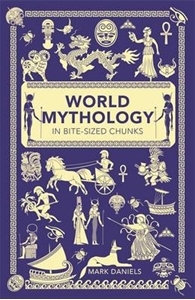 With a stunning array of fascinating tales, World Mythology in Bite-sized Chunks gets to grips with the ancient stories of Aboriginal, Sumerian, Egyptian, Mesoamerican, Maori, Greek, Roman, Indian, Norse and Japanese cultures, encompassing legends from the most diverse societies and the most ancient cultures from across the globe. Learn about why Odin, the Father of the Gods in Norse mythology, was so keen to lose an eye, the importance of the Osiris myth of Ancient Egypt, and much more besides. Entertaining, authoritative and incisive, this is an enlightening journey into the fascinating world of mythology.